Christmas in Japan–Spiritual or Superficial? Celebrating Christmas is very popular in Japan, but December 25th is NOT a national holiday in Japan. Japanese people work and go to school as usual. But although only about 1% of the Japanese population is Christian (the rest are Buddhists and Shinto) Japanese Christmas is a big Day, with traditions that are uniquely Japanese. Sending Christmas cards to friends is one of the traditions in Japan that is building but more traditional is the New Year’s printed and written notes on New Year’s post cards. ‘End of the year gifts’ for your boss, Kid’s teachers, and friends is a Christmas custom here and the gifts are bought at department stores, so the receiver can check the price and return something around the same price. Strangely, the Japanese Christmas is like Valentine’s Day, while the Japanese New Year is celebrated like a traditional Western secular Christmas. Christmas is when the Japanese people prepare decorated trees, have Santa clauses, gifts and Christmas decorations. They then have traditional decorations right after that for New Year’s including evergreen bows, stacked pounded rice mounds that are offered to their gods and visit the local shrine on New Year’s Eve night as well as during the day. Many couples will make Christmas Eve a date night including eating Kentucky Fried Chicken together or families have it in their home together. 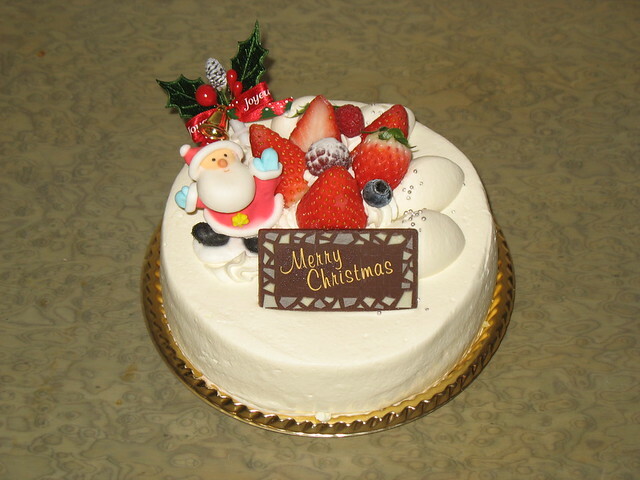 The essential Christmas dessert in Japan, called ‘Christmas Cake’, is a white sponge cake, smothered with cream and fresh strawberries. This cake is often decorated with miniature trees, flowers, and a Santa Claus. It will also include Merry X-MAS or Merry Christmas on it. These also are ordered through stores and personal door to door delivery. Christmas Eve is considered a romantic time. Couples exchange presents and go for walks, they view the Christmas lights and enjoy a candlelight dinner for two. Booking a table on Christmas Eve can be very difficult. Interestingly, Christmas in Japan is for friends and parties, whereas the New Year is reserved for the family with visits to a temple or shrine. In the West, it is the opposite: families are together on Christmas and may go to church services, but the New Year is a time for meeting with friends and having parties. Do you see what is missing in the Japanese Christmas in all that has been said? While lights, Santa and Santa hats abound, you will never see Nativity scene sets to be bought in the stores (unless it’s COSTCO) and most of the old carols are set to rocky music. It is sad that Japanese people do not know the reason why Christmas is so special to Christians, but it is wonderful that they recognize it as a time to celebrate. This gives us an opportunity to rejoice with them and tell the wonderful story of how Jesus came to live amongst us, and how he reconciled us to the Creator God. 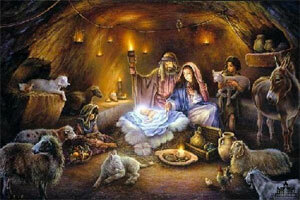 Our Christmas program every year is a source for getting the true message of CHRISTmas to those that attend. And many that will never accept an invitation to come during the year will finally accept for this occasion. May Christ be the center of our lives each and every day and be a source of joy and extra opportunities through the Christmas season. Blessed Christmas to you and yours. We trust you truly know the Christ of Christmas and if you don’t, why not write and ask! God bless you!